Today the Embassy and Permanent Mission of Afghanistan in Vienna hosted a memorial ceremony and Khatm-e-Quran “Fateha” in memory of the victims of a terrorist attack which occurred last Tuesday in the Argan district of Paktika province. 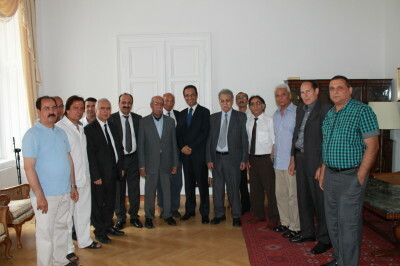 Members of the Afghan community, including representatives from various Afghan Associations and representatives of mosques in Austria, gathered at the Embassy and mourned the victims of one of the most devastating terrorist attacks of recent times in Afghanistan, in which almost 100 lives were lost during the holy month of Ramadan. Following the prayers, Ambassador Erfani spoke with those gathered about the challenges still facing Afghanistan in this period and demonstrated his solidarity with the victims of the attack and their families. The Afghan community expressed their strong solidarity with the victims in Argan district, emphasized the unity and understanding of Afghans for the need of stability in Afghanistan and expressed their readiness and commitments to join Afghans in the country and abroad who are making concentrated efforts towards a stable Afghanistan.